After a four year hiatus from the slopes, yesterday I found myself back again! 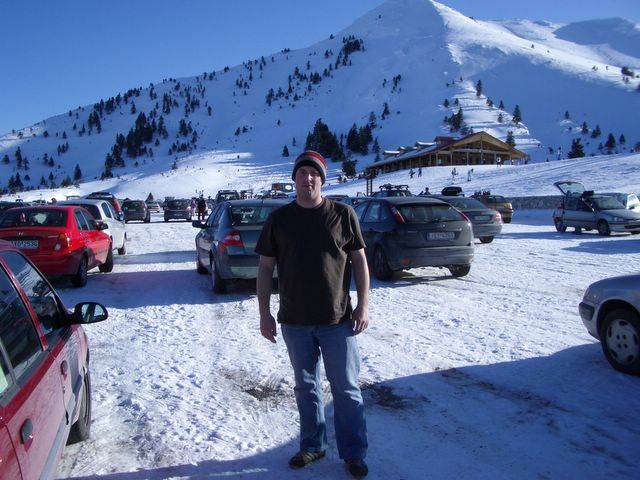 Remarkably, Greece has a few great ski resorts and we decided it was time to give them a try. I was looking forward to it despite the horrors of my last ski/snowboard trip. We left on the 4:15pm boat on Friday arriving at the mainland around 5:30. I did a route planner and it suggested that it may take up to four hours to get there. After getting a little lost (for the record Mr President, they are called "road signs", readily available in most developed countries) we appeared to finally find the "main road" that would lead us all the way to the resort. After a while without signs, we saw a gentleman in a small village and decided it would be prudent to ask for directions. Great, he told us, this road, another 30 minutes. As suspected, it looked like we would be completing the run in under three hours. It was about an hour later that we approached another village that came in to view at the bottom of a very steep hill. I just turned a corner, touched my breaks and slid for about 10 feet. Good job I was going very slow. Anyway, the next mile took us about 20 minutes at a guess but at least we had arrived. Wrong! This was actually just a village in the mountains, not the resort of Kalavryta! A little fed up we drove for maybe another hour, never getting above 30km/h when we arrived at a much bigger village. The only thing that really stood out in the village was a big sign that read "Kalavryta 50km". We were horrified. We had stayed on the same road the whole way (in fact, I am not sure there was even a turning off) and now found ourselves fully 50km away from our destination. It was pitch black dark, the roads were horrific and we were not happy bunnies. We were now faced with a decsion to try and find a room for the night or carry on. Maybe against our better judgement we carried on. About 5 km in to our journey I had serious regrets. We were just driving up and up and up, further in to the roof of the mountains. There was black ice on the roads, HUGE drops at the side of the road and no road barriers. I kid you not, at times our speed was not even registering on the dial. We would go over an hour without seeing a car, because we were in the middle of nowhere, only Maria (our friend who came on the journey with us and kept us smiling in troubled times; her "husband to be" is a very lucky man) had any reception on her phone, but only had 1 minute 40 seconds of call time left. At every opportunity I was looking for places I could "roll back" in to should the car slide backwards. It really was not very pleasant. Anyway, to cut a very long story short /quite long (delete as applicable), we arrived at about 11pm, absolutely exhausted. Kalavryta is a fabulous place, not a typical ski resort but lovely. It has some lovely restaurants (shame they all are smoke filled!) and views to match. We were very lucky with the hotel as it was very pleasant and reasonably priced. The skiing was a lot of fun although I must confess to aching quite badly by the end of it. The trip was actually cut a day short as it poured with rain on the final day and our lack of suitable clothing dictated that a drive home was a better option. I did purchase a set of ski blades (mini skis) which are a lot of fun so, we hope to go back next week but only for the day. We found a different way home which is considerably further but much easier and only 2 hours 30 from the port. Changing subject, we are very settled in the new house and it is so much warmer thatn the last one where our only heatng was small electric radiators or the small fire.The weather has been woeful for the last couple of days, freezing cold (outside), driving rain and gusting winds. It still looks so beautiful, even then.